HealthSense ™ high fiber wheat flour delivers up to ten times the amount of dietary fiber of traditional wheat flour, with the performance, taste and texture of traditional refined wheat flour. Derived from high amylose wheat, the fiber in HealthSense flour is naturally occurring resistant starch, and is delivered directly from the farm, not from a factory. It is considered intrinsic and intact by the newly proposed FDA definition of dietary fiber. Insufficient dietary fiber intake has been linked to a number of conditions including diabetes, obesity, cardiovascular disease and colon cancer. In the United States, most people only consume about 50% of the amount of fiber that is recommended for a healthy diet, and this is commonly referred to as the “fiber gap”. By replacing the traditional flour in foods with HealthSense, we can significantly reduce this fiber gap, without increasing costs or calories for consumers and without sacrificing taste in the foods they love. In other words, people can feel good about eating wheat again. HealthSense high fiber wheat flour is available to North American food manufacturers only from Bay State Milling. We have developed robust supply chains of Identity Preserved, Non-GMO Project Verified wheat varieties by collaborating with best-in-class wheat breeders and farmers with whom we share a common goal of feeding the world in a healthier way. We’d love to have you join us as we change the way people think about wheat. 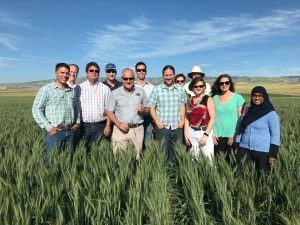 Members of the Bay State Milling team with our partners in a HealthSense High Fiber Wheat field in Washington.